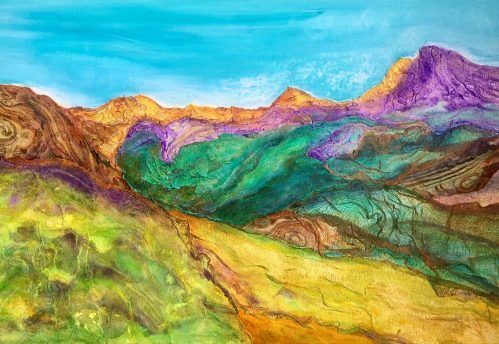 In April, National Autism Awareness Month, the Rosendale Cafe proudly presents “Moving Mountains,” an exhibition of new and recent collages by Susan Angeles. Please join us for an Opening Reception on Sunday, April 7, 2pm to 4pm. The show will run from April 2nd through April 29th. The artist will donate 30% of her artwork sales to the Anderson Center for Autism. In painting a series of mountain scenes for this show, Susan Angeles drew inspiration from the unwavering commitment of the autism community—family members, caregivers and direct support professionals who have dedicated their lives to advocating for individuals on the autism spectrum. “Oftentimes, the challenges for individuals with autism and their caregivers seem insurmountable. But when we work together as a community, we can accomplish a great deal. We gain the strength and courage to move mountains,” says Susan Angeles, whose eldest son is a resident in one of Anderson Center’s group homes in Dutchess County. Susan Angeles currently serves as vice-chair on the board of the Anderson Foundation for Autism, and is a founding member and former officer of Anderson Family Partners. She also was one of the co-founders of Anderson Center’s art program, Expressive Outcomes. Susan holds a BA in Humanities/Art History from the University of the Philippines and an MBA from NYU Stern School of Business. Born in the Philippines, Susan first received her formal art instruction during the mid-70’s through private lessons with Sofronio Y. Mendoza (SYM), a renowned Filipino artist. Her earlier works were mostly charcoal drawings and post-impressionist landscape paintings in oil. Today, she continues to study at The Art Students League of New York. She has shown her work through various group shows sponsored by The League, and at the ArtBar Gallery in Kingston, NY. She lives in Ulster County and New York City with her husband, Larry Godfried, a studio furniture craft artist who works in terrazzo.